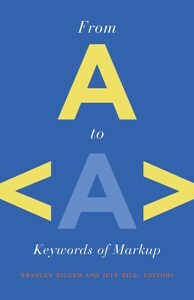 Bradley Dilger and Jeff Rice’s edited collection From A to <A>: Keywords of Markup (University of Minnesota, 2010) introduces its essays by arguing, “Markup is the first thing Web writers engage.... In the age of new media, there is no way to avoid markup. Markup is text. Markup is communication. Markup is writing” (xi). Markup—the codes and tags that make it possible for information on the internet to be organized, formatted, delivered, and even produced—is often invisible to the internet user, save in instances when it calls attention to itself through its absence or failure to mediate one’s browsing experience according to expectation. However, as Dilger and Rice note, the conversation about markup is a process that has been ongoing since the earliest days of the Web: users continue to discuss how to consolidate best practices in coding and accessibility, how to think about issues of intellectual property, as well as ways of achieving consistent displays across a range of browsers and platforms. Dilger and Rice’s collection, which recently won Computer and Composition’s 2010 Distinguished Book Award, uses a keyword approach in its examination of several different markup tags in order to develop a vocabulary for discussing Web-based rhetorical and composing practices and to connect these practices to cultural and ideological environments. Michelle Glaros looks at another reviled tag, <frame>, in “<frame>ing Representations of the Web; she argues that linear expectations of literacy dominate our understandings of how a document ought to behave, even when digital modes of writing offer the possibility of texts composed with non-narrative epistemologies, and suggests that these possibilities may still be open to users willing to reconsider the impermeable nature of framing borders. Matthew K. Gold looks at a similar tag often used to enforce the linear expectations for writing in “Breaking All the Rules: Using <hr> to Create Space in Online Writing Environments.” Gold traces the history of the horizontal rule from its inception as a way for writers to break text into smaller units with simple lines to a more decorative, ornamental design element before falling into disrepute; he argues that its legacy as a way of enforcing linearity remains within CSS standards of presentation. Jennifer L. Bay turns the collection’s attention to the <body> tag, using her chapter “Body on <body>: Coding Subjectivity” to trace how users seek to authenticate their interactions with others through a drive to represent the corporeal body through their online profiles, avatars, and personas; thus, for Bay, the body becomes a part of the content enclosed by the tag <body>. Helen J. Burgess tackles how invisible-to-user scripting codes such as PHP function much like the pecia marks that enabled early printers to assemble alphabetic texts. Her chapter, “<?php> : “Invisible” Code and the Mystique of Web Writing,” notes how this “invisible” intervention of scripting commands places a bar between those who read the Web and those who would do or create the Web and suggests that this shift demonstrates an increasing need for the ability to understand the database logic that drives such scripts. In “From Cyberspaces to Cyberplaces: <img>, Narrative, and the Psychology of Place,” Rudy McDaniel and Sae Lynne Schatz argue that there is no single “cyberplace” but instead a collection of cyberplaces that are formed, in part, through the integration of images that offer a way for users to create a shared narrative. Bradley Dilger also tackles the visual element of the Web in “<table>ing the Grid” as he traces the history of <table>’s use as a tool allowing designer’s to create grid-like layouts and how this preference for such layouts persists within CSS’s aesthetic of boxy layouts and precisely placed elements, noting that while such an aesthetic may promote order and minimalism, it also enforces an inflexible approach to content and presentation. Finally, Cynthia Haynes’ afterword to the collection, “<meta>: Casuistic Code,” looks back to how the forerunners of modern computers were used to track individuals with traits and identity-markers perceived as undesirable by Nazi Germany. Haynes connects those conventions with the contemporary trend for tagging metadata, challenging readers to remember always that markup is never free of its context and that it always bears a relationship to the cultures, institutions, and ideologies from which it emerges. While From A to <A> does not—could not—create a comprehensive encyclopedia of the array of markup tags Web designers have at their fingertips, its collection of essays achieves what the collection sets out to do by introducing an overview of several significant pieces of markup, situating them in the history of the Web and of Web design, and offering ways to think about the rhetorical and theoretical significance of how Web users interact with (or are oblivious to) the ways these tags shape the experience of browsing the Web. The collection identifies itself as a place to begin the conversation about the rhetorical and cultural significance of markup in our literate practices—the beginning of a “vocabulary of vocabularies” as Dilger and Rice put it in their introduction to the volume (xvi)—and succeeds remarkably well. Each essay is thoughtful and thought-provoking and would serve well to start classroom conversations about the ideological choices at stake in Web design. If there are any drawbacks to this collection, perhaps it would lie in the fact that the authors and editors do not shy away from using the specialist vocabulary of Web design. Though each chapter includes an overview of the markup tag under discussion and the individual authors do situate their discussions with explanations of how their chosen tags function, it is clear that readers of this volume are assumed to have at least a passing familiarity with the basics of markup. However, this assumption allows the authors to dig deeper into the thorny questions about the place of markup within our understanding of digital literacies and rhetorics, so perhaps this is not so much a bug as a design feature. In addition to this feature, while many of the authors use specific examples of contemporary social networks and Web sites, they do not rely on such examples to carry their points, which suggests that this volume will be a durable addition to the field of software studies.